A group of Palestinian youths on Saturday morning closed road No. 60 linking between al-Khalil and Occupied Jerusalem. 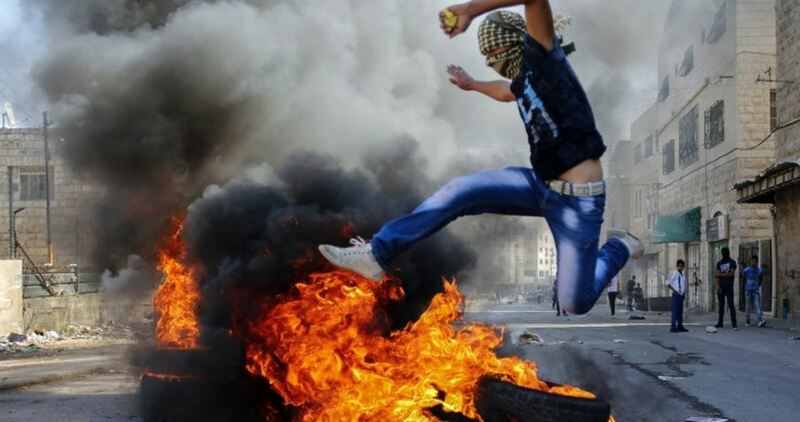 The PIC reporter said that dozens of Palestinian youths set tires on fire and erected stone barriers to block the main road for the Israeli settlers moving between the settlements of Jabal al-Khalil and Jerusalem. Many Israeli military vehicles and bulldozers later arrived at the site and started to remove the tires and barriers. A few days ago, Palestinian youth groups on social media websites called for closing bypass roads in the occupied West Bank that are mainly used by the Israeli soldiers and settlers. In another context, an Israeli military force at dawn Saturday stormed al-Ramah neighborhood in al-Khalil, arrested an ex-prisoner and confiscated the family's car. According to the PIC reporter, five Israeli military vehicles broke into al-Ramah neighborhood, raided the house of the Palestinian ex-prisoner Ghassan al-Qawasmi, and wreaked havoc on it before arresting Qawasmi and taking him to an unknown destination.